SHEESH! what can we eat? Surely we don’t want any of that “test tube beef”, iiiiiiiiiick! Whew! Wipe the sweat off my unscientific-show-me-brow. Shouldn’t they have checked their “connections” before making the premature announcement that neutrinos could be faster than the speed of light? 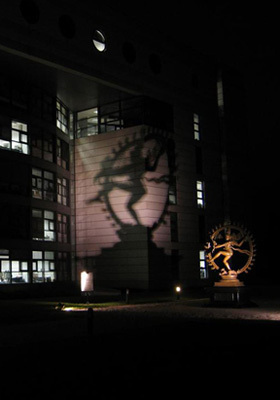 These physicists were pretty carried away with their suspicioned observations though I give them that it is understandably what they dream to discover the universe’s secrets being the whole purpose of CERN. And frankly if they don’t find out something(s), will they be able to indefinitely keep these billion dollar experiments financed.? I think not…..Black holes, quarks, neutrinos have such fascination, but where are we going with this research, to the moon, the stars, other solar systems? WOW! 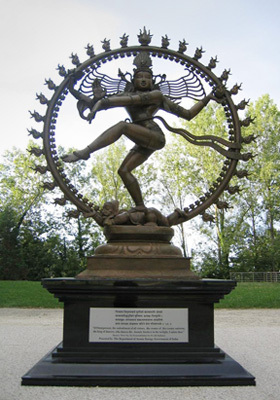 CERN is the parent of the World Wide Web! This organization bears a lot of study here is a rather creepy (to me) statue that represents “what it’s all about”???? I think I’m so fascinated that I’ll research a little history too, imagine this, CERN was begun at the same time the European Union (secretly) came into being! It is becoming clearer and clearer that the ptb are very, very worried about you and me communicating and sharing information. The “parchment” is nowhere to be seen in these actions to shut up we the people. These edicts come down to us with no authority other than their capricious will to dominate us with their politically correct propaganda. As long as we have the power to communicate, we must not be cowed and quelled into silence. Speak now, share now, they can’t long suppress the truth, it will come out, it will come out, it will come out! If embeded video below (it is not a copyrighted one so it by rights should play, it is getting harder to share youtube videos) will not play just copy & paste this link to article. Paul Joseph Watson asks why three seperate branches of the federal government are rushing to monitor social media 24/7. Ronald Regan appointed Charlotte Iserbyt in the 1980s to work in THE heart of Federalism of Education at the moment of it’s birthing to Out Come Based Education which moved our entire system away from the traditional liberal arts critical thinking model and instituted the Agenda 21 educational standards toward changing education of minds to training of minds, aka Skinnerian Pavlovian dog training style. Children were to be regarded as Human Resources instead of Human Beings. One problem occurred with Mr. Regan’s choice to fill a position that was supposed to be simply a filler/transitional job during the change period. That was that Mrs. Iserbyt was not only the daughter of a well connected insider family but she was an educated and curious individual who loved her country and did not want to see it meld into a global oligarchical order designed to eliminate the middle class and create a world of only two types of people, the 0.001 % rich ruling the 99.999%. She opened the books and files of her predecessors and found the entire plan to “dumb down America”. What she found lead her to a life’s work of research and then publishing of these official federal and private documents and letters that detail in shocking undeniable words the entire plan to subvert the USA through the forces of EDUCATION through the precious malleable and moldable minds of our youth. In the below interview Charlotte Iserbyt shares Maine’s governor has passed a bill that will serve as a shot over the bow of all states to all citizens to rally to stop this next phase of Agenda 21. If you want to have a stake in your future or understand how people can allow despots to rule take time to read Gellately’s from-the-German-archives-public-records that show 1 in 7 German citizens were the eyes and ears for the Stasi informing upon their neighbors as well as their own family members. “See something, say something.”? Today the stage is set for the United States of America to indulge in the same types of monstrosities of WWII despite our politicians, pastors, and self-righteous citizens protestations. Evil doesn’t rule in a vacuum, it has to be invited to take over the heart through greed, revenge, jealousy, fear, selfishness, and hate. 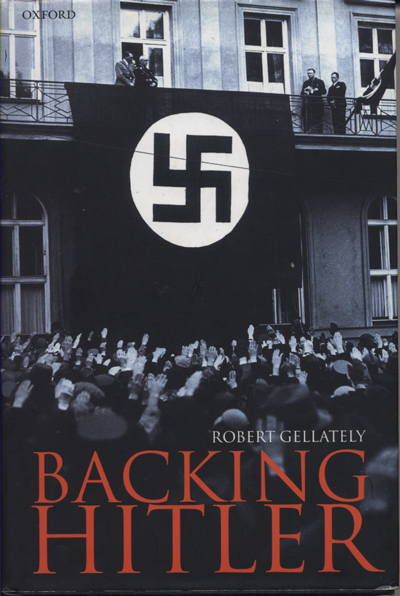 His book, Backing Hitler: Consent and Coercion in Nazi Germany, 1933-1945 (Oxford University Press, 2001), aroused international attention. That study has since been published in German, Dutch, Spanish, Czech, Italian, French, Japanese and Portuguese. A special paperback edition was published and distributed by Germany’s Federal Agency for Civic Education for use as a textbook. Gellately edited The Nuremberg Interviews: An American Psychiatrist’s Conversations with the Defendants and Witnesses at the Nuremberg Trials (New York: Alfred A. Knopf, 2004). The book has thus far appeared in more than a dozen foreign languages and was the basis of a docudrama broadcast on French television in 2006. Professor Gellately has co-edited several volumes of essays, including one with Russian specialist, Sheila Fitzpatrick, Accusatory Practices: Denunciation in Modern European History, 1789-1989 (Chicago University Press, 1997). With FSU colleague Nathan Stoltzfus he co-edited a collection called Social Outsiders in Nazi Germany (Princeton University Press, 2001) – which was translated into Turkish. And together with Ben Kiernan, Director of the Genocide Studies program at Yale, he co-edited The Specter of Genocide: Mass Murder in Historical Perspective (Cambridge University Press, 2003). The latter work has since appeared in Italian. Unbelievable! NY Times Blasphemy Against US Constitution! I never thought I’d hear our beloved US Constitution coming up short against the likes of the defeated defunct disgraced disbanded USSR’s! Here in the self declared “newspaper of record” the New York Times does that and more. It is of great interest that it attacks our Second Amendment right to bear arms and calls us out of step with the world and tells that our stance must be incorrect because we have only Guatemala and Mexico for company in the insistence to keep the ability for citizens to defend themselves. Interesting especially now that our country is under threat from within not without of losing ALL INDIVIDUAL civil rights. Our Bill of Rights come under especial criticism in the article. Those same rights that are being wrested away from us in an ever increasing frenzy of midnight legislation passed without our Congressmen and Senators even reading their hundreds of pages of detailed usurpations of the liberties our founding fathers brought forth “in order to create a more perfect nation”. The Presidential arm of the three separate arms of our government has since WWII taken upon itself dictatorial powers to null and void the other two arms in edicts of Presidential Directives by capricious will alone. Our US Constitution is bleeding and under great duress and being strangled by the neck. (Flag Code Section 8a. “The flag should never be displayed with the union down, except as a signal of dire distress in instances of extreme danger to life or property.”) This is our condition and most citizens go about daily life pursuing their individual happiness in ignorance. This Republic is not ended as the NY Times wants it to be in the article linked below, but it is being attacked in the most subtle ways every day and now in this most vicious and slanderous manner. The very idea that our US Constitution protects “relatively few rights” is preposterous! Regulate sugar, take aspertame, etc. Not plesant, but hey hiding your head in the sand like an ostrich won’t save you. WAKE UP ALREADY! Life is not a movie, but truth is stranger than fiction. These blimps reported by ABC and MSNBC are NOT aliens! Hello! 2004 MSNBC report on Homeland Security launching these blimps. The unmitigated ignorance of the public is amazing! Robots, Secret Space program, Soldiers microchipped, research photo of 1974 Florida Palmento Bug also known as Florida Cockroach with transister. Drones automated control killing. The 7 major grains are infected with genetic modified crops. Aldus Huxley UNESCO speech 1962 savoring the technological total control over humanity. Just to introduce the subjects of “Modern Life”.